The college decision deadline is fast approaching. Some students will have no problem choosing a school by May 1, yet others might benefit from attending an accepted student event. Do you know how to make the most of those "accepted student days"? Read independent college consultant Lee Bierer's tips for maximizing your experience at accepted student events. These events are designed to show off the best aspects of a particular school, so it's difficult for any student not to fall in love. Bierer recommends getting engaged and talking to people on campus. As you spend time moving through the school's itinerary and talking to people on campus, take notes: these notes will be valuable in comparing schools later on. Also try to take notice of the real campus culture so that you get an accurate idea of what social life on campus would be like. Follow Bierer's tips, and you'll be able to make a confident college decision after going to your accepted student events. 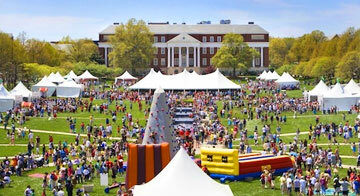 What have you thought of "accepted student day" events? We would love to hear your thoughts in the comments below.